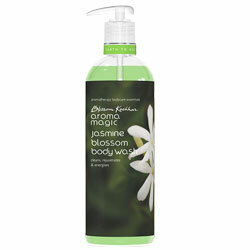 Aroma Magic Jasmine Blossom Body Wash - Cleans, rejuvenates & energises - Natural Body Cleanser - Remedy for skin rashes. Natural body cleanser that leaves your skin bright, alive and satiny smooth. 100 % free of parabens, harsh chemicals, alcohol and artificial fragrance. Jasmine extracts in me combine together to give a fresh start to the day and keep your skin youthful and vibrant. Exotic blend of geranium and sandalwood essential oils transforms your bathing experience into an ultimate hydrating indulgence. Soothe sensitive and irritable skin and am an effective remedy for skin rashes. Enhance the skin suppleness and reduce the effect of pollution that causes stress for the skin. Leave you with a velvety, sensuous feel and a delicate fragrance that uplifts your confidence. Shake me and pour required amount onto you hand or loofah. Massage your wet body to work up a lather. Rinse off. Use me everytime you bathe. Aqua, Apple cider vinegar, Cocos nucifera oil, Organic vegetable gum , Tagetes patula extract , Pelargonium graveolens essential oil , Jasmine blossom essential oil , Santalum album essential oil , TocopheroI-Rich extract Vit-E, Optiphen, Colour (food grade).